My original plan was to chill in La Paz for two nights and then head down to the Salar de Uyuni, the world’s largest salt flat and the coolest place to take pictures of you hugging a smurf (los pitufos!). Alana had told me that you could just arrive at the bus depot the day you wanted to depart and hop a 12 hour bus that, she said, was $12US. Though I was nervous about the ride – going alone, cold, horribly bumpy last 4 hours – I was excited to see the Salar. I returned to my hostel to find that my friends had moved on to Peru, save for Lee W., and that their bunks were now occupied by a pair of Brits (I think) en route to Paraguay. After discussing the bus depot with them and the hostel travel person, I discovered that not only were the tickets sold out for the night, but they were also sold out for the following night. Still, the British pair said that if they could not get their flight to Paraguay pushed back a day, they couldn’t go, and would sell me their tickets. While I hoped their flight would work out for them, I also secretly hoped I could snag a ticket. This did not happen, but as Robert Burns wrote, “the best-laid plans of mice and men go oft agley” (awry). Bummed, I figured Lee and I could check out Cholita wrestling (look it up), but the bus had left already so we hit up this Mexican place called La Cueva in Plaza Murillo and Tarija, where a slew of cool restaurants and bars are located. 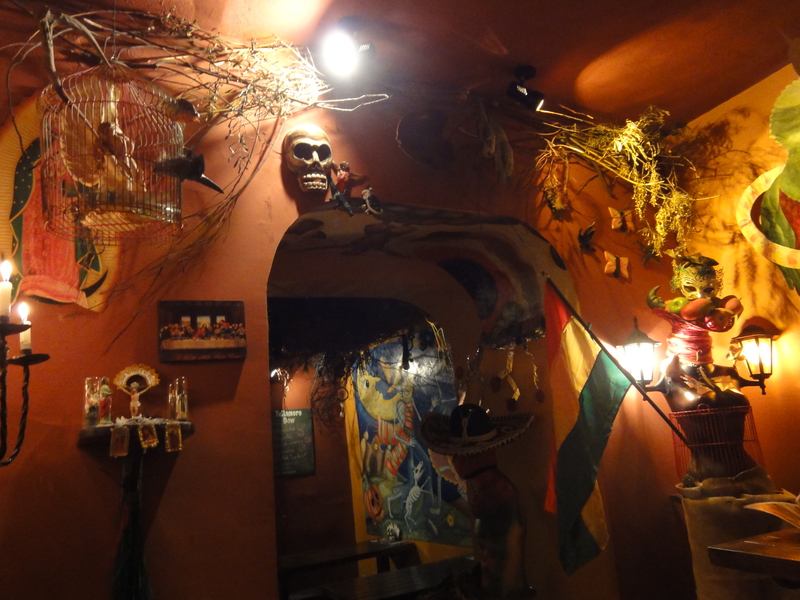 We got margaritas, nachos, and quesadillas for pretty cheap, and the decor is warm and eccentric. Later, I ventured to Oliver’s Travels, where I was last year for the World Cup. Funny how things come full circle, and at the same time, how they don’t. 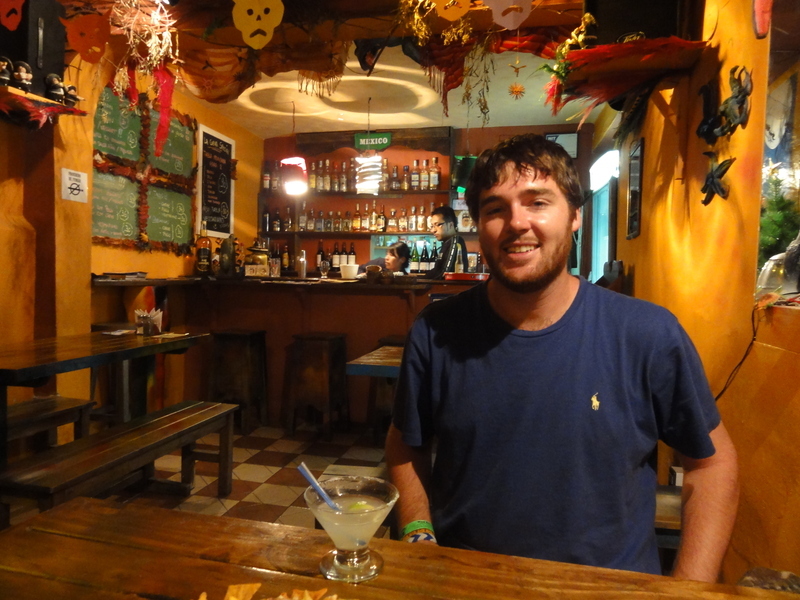 The next day, I was lucky enough to get the full food tour of Bolivia. 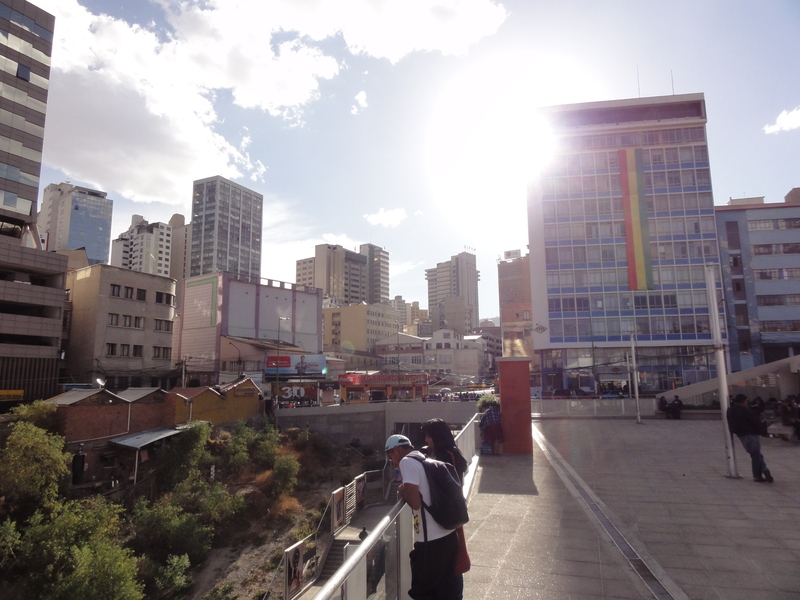 Last time I was in La Paz, I was overly careful and did not try anything that might upset my stomach, especially including street food. 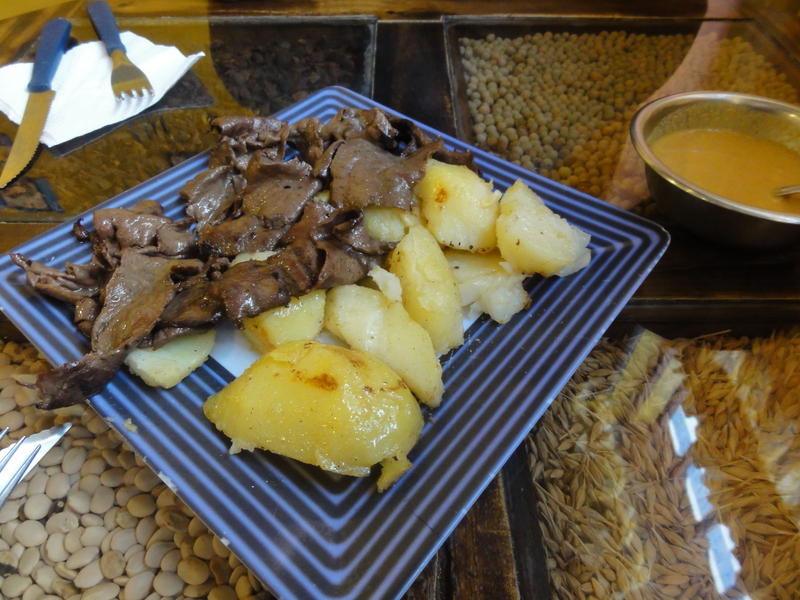 The biggest risk was cow tongue and chunas. This time, I decided to do it right, and had the best guide to show me around. I will break this down chronologically so you understand how much we ate and in how little time. Api is the purplish drink that’s nice and hot, and looks like a Christmas candle. It’s got little specs of various purple and red colors that look like glitter, and it tastes cinnamon-y and very much like perfection. I had it last time, but there’s no passing up api. It’s actually made from maize, but I’m not sure how. Bunuelos are the sweet fried dough, and were thin and very tasty. 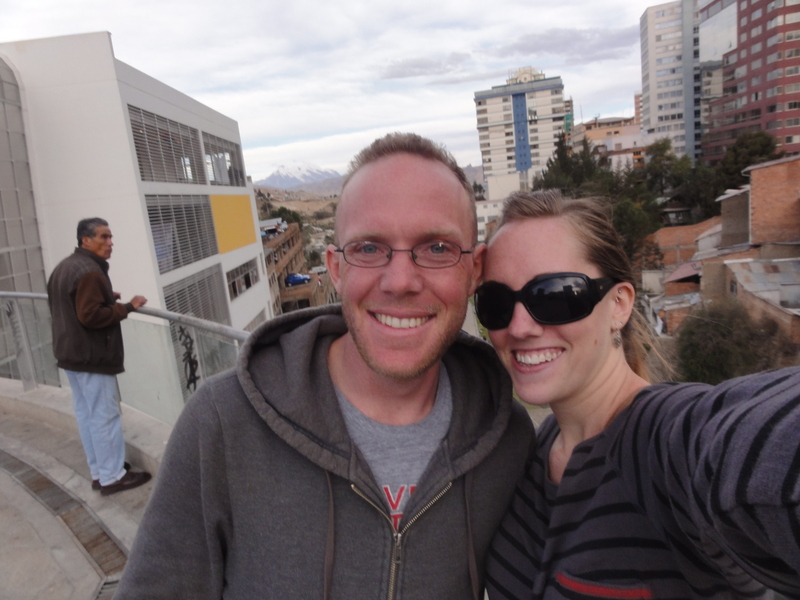 We ventured to a street stand where we ordered a salteña, which is kind of like an empanada. It was filled with meat, veggies, and maybe a potato, and tons of juice. I began the consumption daintily and without much mess until Cody took a bite and unleashed a torrent of sauce all over the pavement, rendering the napkin useless. Then we got a tucumana, which was similar but with less juice (and less mess). Inside were veggies and, to my surprise, half of a hard-boiled egg. The only place where traffic is worse than in La Paz is India. Drivers in La Paz consider most traffic laws mere suggestions, and it becomes difficult for pedestrians to cross the street. Enter the zebras. They help you cross at the “zebra” crosswalks. 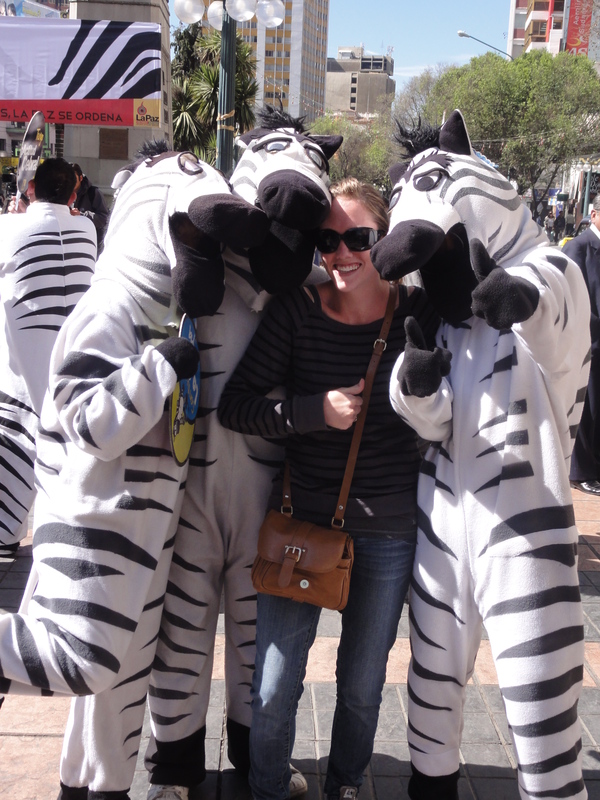 Lucky for us, it was the weekly zebra meeting, so they were out in full on Monday listening to encouraging pep talks from their bosses and posing with silly gringos like myself for pictures. In between, I ventured off to the coca museum with Lee, who sampled a coca leaf. I was not brave enough to do this. The museum was interesting, and claims that Coca Cola still imports coca leaves, if only for the flavor. What is antecucho you ask? Oh, just cow heart. I missed out on it last time, playing it safe, but according to my sources, it’s what people eat after a good night of drinking. 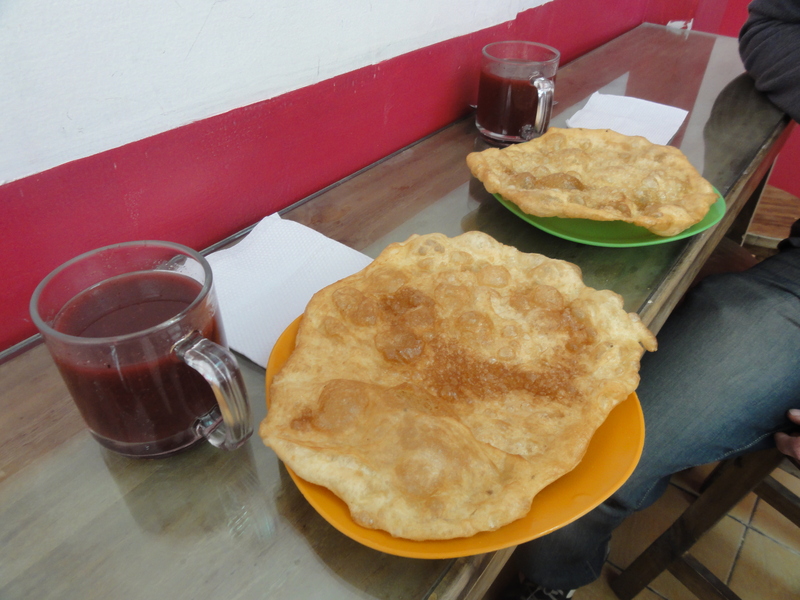 And at appropriately named “Antecucho Mania,” we got to eat it ourselves, stone sober. Imagine what the texture of a heart might feel like, and you’re probably spot on. It tasted…different. I’d say it’s an acquired taste. Everything preceding this could easily make a meal for me, but this was very new. Regardless, we ate it anyway. And we were still hungry, so we both ate burgers and fries, obviously not traditional Bolivian food. I tried to order two Cokes, but that was apparently too difficult and I had to hang my head in defeat and ask Cody to do it. Of course they don’t have two Cokes. They sold them to me, but they just didn’t have them in the fridge. Always! After eating quite a bit, we headed to a park to digest and watch pigeons. 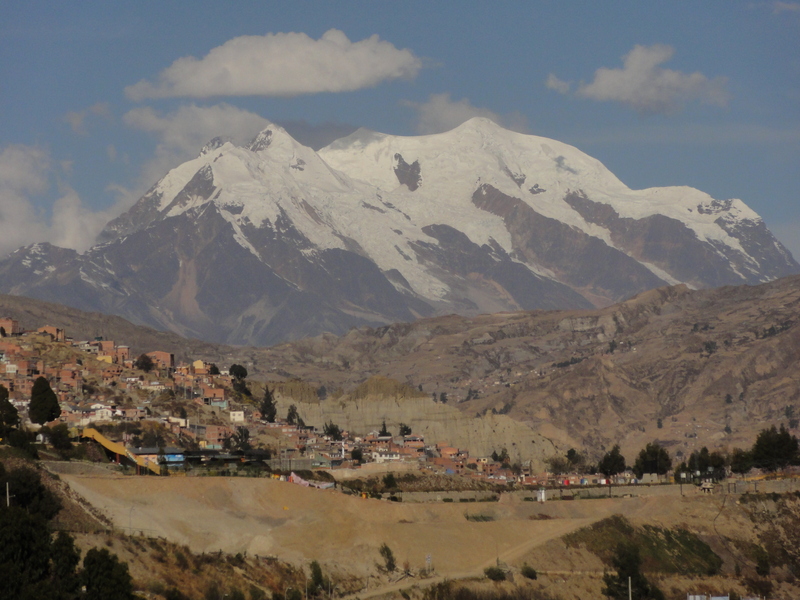 The park was very calm and provided a beautiful view of Illimani. It was close to 6, and despite the fact that I ate like a shark (which will eat anything from humans to license plates), we decided it was time for ice cream, and finished off our tour at a cool little place with funky chairs and, the best invention ever, a callbutton for the waitstaff. Haha I can’t believe you guys ate so much! And cow hearts?! You deffidently have a lot more guts than me, I would never in a million years. That sunset picture is beautiful.